Thoth-Hermes-Michael – the lineage is clear. A powerful guardian of high places, St. Michael is protector and a great Archangel of Light for our current era. Regarding Albion this goes back a long way into pre-history. A great, straight pathway once crossed England from Norfolk to Cornwall and the Romans built part of the Icknield Way along it. As a nearly straight line it was rediscovered in 1969 and is now known as the Michael Line as it passes through landscape landmarks such as Glastonbury Tor and Avebury (see ‘The Sun and the Serpent by Hamish Miller and Paul Broadhurst, Pendragon Press 1989). 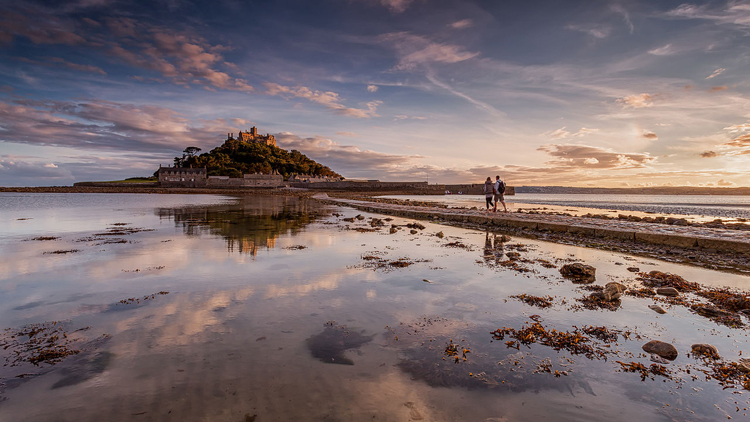 The line (a form of energy current measurable to humans by dowsing) enters Britain at Carn Brea in Cornwall and soon enough passes through St. Michael’s Mount. Location: Near to Marazion on the south west tip of Cornwall.